A delicious treat for autumn! This recipe is one of my absolute favorites for avocado toast! It originally is from the cookbook "Chloe Flavor" by Chloe Coscarelli and its been my go to when I need something more than just cereal for breakfast. I made a few adaptations, so be sure to try both this and the original recipe as well. Very filling, savory, and delicious! One thing that I love about cooking is that you can create so many different dishes with only a few simple ingredients. Take this stew for instance. You can make it in less than an hour and with only a few items, it's perfect for lunch or dinner! Tomorrow is Valentine's Day and it's the perfect time to make a sweet treat for a loved one (or even just for yourself!) 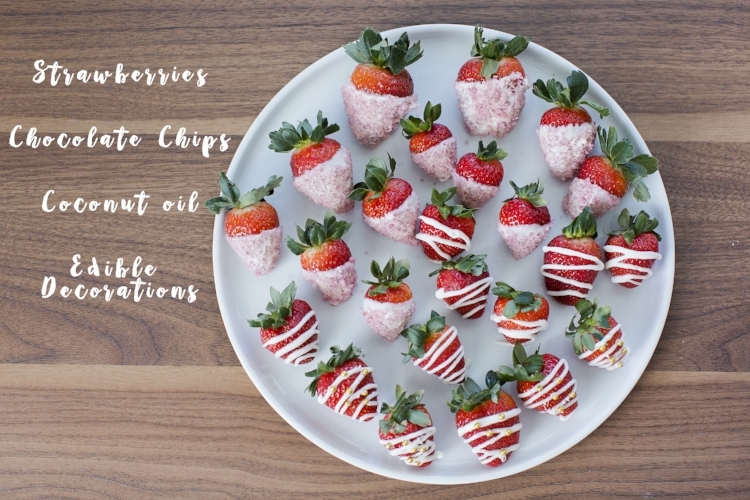 Today we're sharing this yummy, easy chocolate covered strawberry recipe perfect for tonight's Galentine's Day festivities, tomorrow's Valentine's Day dessert, or even just as something to bring to the next party! Happy Thanksgiving! If you're anything like me, you wait until the last minute to decide on a recipe when entertaining or bringing food to a party. If that sounds like you, you're in luck! I have 2 great appetizer recipes that each require only three ingredients. Enjoy! I never knew how easy it was to make kettle corn! It takes four ingredients – oil, popcorn kernels, sugar, and salt – and only five minutes. The sweet smell filled up my whole kitchen, and it was so much fun to make! With the arrival of fall and the chilly temperatures, we are so excited to start making some yummy soups, stews, and baked goodies. Today, we're sharing a recipe for squash soup with a spicy green pepper drizzle!